Getting rid of the city clerk and treasurer offices and reducing aldermanic control over development projects in wards are just a few of the ideas that mayoral candidate Gery Chico proposed at a session at the Institute of Politics (IOP) on Monday, January 28. 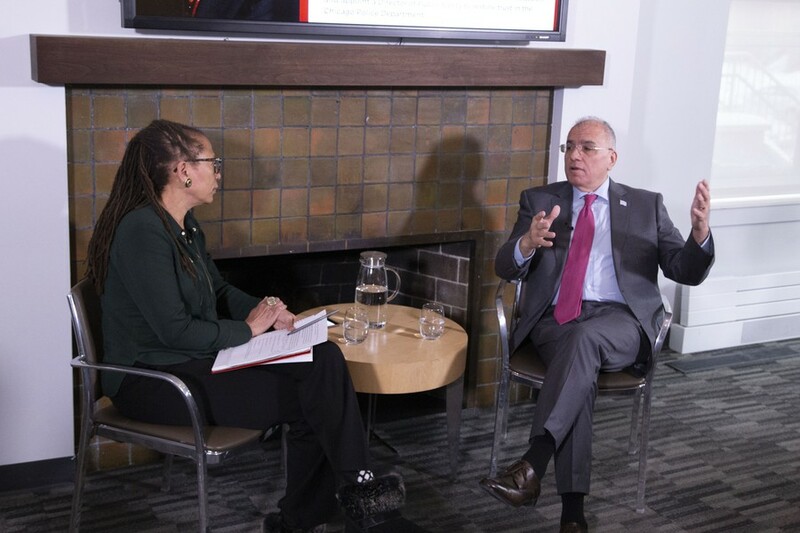 Chico was interviewed by IOP Pritzker Fellow Laura Washington as part of the IOP’s ChiElect programming, which exposes students to candidates and issues being discussed in the upcoming city elections. This is Chico’s second mayoral race. In 2011, he ran and took runner-up, losing to current incumbent Rahm Emanuel. Chico began his political career as an undergraduate at the University of Illinois at Chicago, when he was hired by the city’s planning department. Since receiving his law degree at Loyola University Chicago in 1985, Chico has served as chief of staff for Mayor Richard M. Daley, president of the Chicago Park District Board of Commissioners, and chairman of the Illinois State Board of Education. Currently, he runs his own law firm, practicing corporate, aviation, and real estate law. When asked about his plan to resolve the pension deficit—the $28 billion that Chicago needs to fund its employee pensions—Chico said that he said he plans to resolve it primarily by cutting back on unnecessary programs and positions, including those of the city clerk and treasurer. While a drastic idea, it’s not the first time Chico has suggested it. He had already been proposing it in 2011 when he first ran for mayor. Chico also called to abolish aldermanic prerogative, which gives aldermen final say in zoning and development projects in their ward. He said there instead needs to be more collaboration between wards and the City. Chico also touched on education. He said he wants to make sure that people across Chicago all have access to good schools. Chico proposed that he could accomplish this by repurposing closed neighborhood schools or building new facilities to keep people from leaving neighborhoods—or the city in general—due to a lack of good local schools. He also proposed expanding vocational and technical education by building a new campus for those areas of study in Chicago. He advocated for Chicago to be a leader in development, calling for the city to use its resources to attract developers. Chico also said he envisions working with entrepreneurs in the city to fill the vacant storefronts he sees across Chicago. He said that Chicago should offer money to entrepreneurs to incentivize them to invest in Chicago and work closely with them to build strong relationships with local businesses. He used Devon Avenue, a street in Chicago with heavy South Asian cultural influences, as an example for what he hopes Chicago will look like in the future. Chico added that he hopes to implement community policing, where police officers regularly work in the same area so they can get to know the locals, in order to improve the relationship that the community has with the police.